Tips for real estate sellers. The average FSBO home sold for $46,000 less than the average agent-listed home in 2013. In December @NAR_Research hosted a Twitter conversation about some of the findings from the 2013 2013 Profile of Home Buyers and Sellers. See highlights from the conversation here, but the screenshot above is one of our favorite tweets. Our area doesn’t have a lot of For Sale By Owners, in fact, most areas don’t have more than 2% or so these days because of cold hard facts like this one. The average FSBO home sold for $46,000 less than the average agent-listed home in 2013. For most people, buying or selling a home is the LARGEST financial transaction they will ever undertake, that is why it’s so important to get an experienced and honest REALTOR® to help you with your real estate needs. 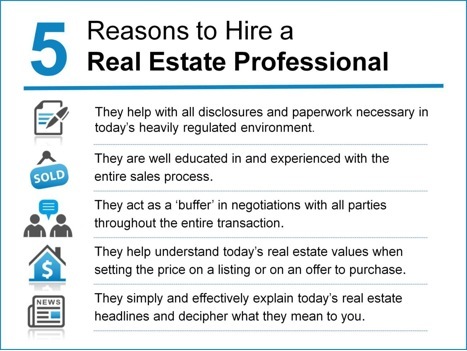 At Crown Realty, all our associates go through extensive training and have a huge support team! Don’t leave it to chance! The Kansas City Association of Realtors® has a team of attorneys review our contracts every year to make sure they have everything we need in them. Only a member of KCRAR can provide you with the proper contracts and addenda to make your transaction legally binding! Did you know that the EPA can fine you thousands of dollars if you don’t have the proper Lead Based Paint Disclosures? A Crown agent can help you avoid some costly mistakes. In a typical real estate transaction, there are over 100 steps to a successful closing. From showings, gathering feedback, receiving an offer, ordering title work, and everything else involved, it’s crucial that you have an expert on your team! The role of a Realtor® is to act as the middle man between buyer and seller in what can sometimes be a very emotional interaction. At Crown, we are experienced negotiators, and as Realtors®, we are legally bound to do what is best for our clients! Crown agents are members of Heartland MLS, and have access to an extensive history of comparable sales data, so we can help buyer determine what the best price to offer is and help sellers decide how to price their listing. Realtors® are required to take continuing education classes every year, and at Crown Realty, we offer our associates plenty of additional training to keep everyone updated. We believe staying on top of the market and current trends is crucial, and we love to share our knowledge with our clients! Let us help you with your next real estate transaction! Line up a contractor to take care of maintence issues your REALTOR® has asked you to fix, like leaking faucets, sagging gutters, or dings in the walls. Let your REALTOR® know if you’re running low on sales brochures explaining the features of your house. Make sure your REALTOR® puts up plenty of open-house signs pointing in the right direction and located where drivers will see them. If she can’t get to it on the Friday before a Sunday open house, offer to do it yourself. Get out of the house and let your REALTOR® sell it! Potential buyers will be uncomfortable discussing your home if you’re loitering during the open house. Take advantage of your child- and pet-free hours by treating yourself to something you enjoy–a few extra hours at the gym, a trip to the bookstore, or a manicure.